Courtesy Photo Above is the logo of the upcoming Many Inspired Steps exhibition at Besser Museum for Northeast Michigan, celebrating the 50th anniversary of the moon landing. 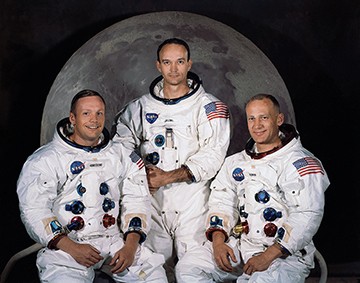 Fifty years after the first man set foot on the moon, the Besser Museum for Northeast Michigan proudly presents the exhibition of Many Inspired Steps: The 50th Anniversary of Apollo 11. The exhibit will open to the public on Saturday, April 27, and run through October 31. An opening reception will be held from 3 to 5 p.m. April 27. 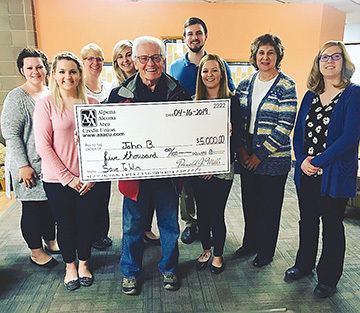 The museum received grant support from the Community Foundation for Northeast Michigan’s Community Impact grant and the Youth Advisory Council grant allowing them to pull together an inspiring public presentation that celebrates the genius, innovation, determination and accomplishments of humanity. Besser Museum Planetarium Coordinator Johnathan Winckowski presented the exhibit idea to museum Executive Director Christine Witulski. “The 50th anniversary of this historic space exploration mission was something he felt should not go unnoticed and would align perfectly with the Besser Museum’s focus on art, history, and science,” Witulski stated in a press release. Courtesy Photo Pictured, from left to right, Apollo 11 Commander Neil A. Armstrong, Command Module Pilot Michael Collins, and Lunar Module Pilot Edwin E. “Buzz” Aldrin Jr. On July 20, 1969, at 4:18 p.m. EST, the “Eagle” landed on the moon. The United States’ commitment to the Space Race, as expressed in President John F. Kennedy’s, “We Choose to Go to the Moon,” speech given in 1962, forever changed how space exploration would be viewed. The 1969 Apollo 11 mission was successful due to the unimaginable technological advancements of that time. Humans worldwide should be celebrated for their contributions to this historic event, Winckowski said. Winckowski contacted Audio Visual Imagineering, who donated the distribution of the Many Inspired Steps exhibit panels. To enhance the exhibition, digital copies of congratulatory letters the United States received in 1969 from nations around the world were obtained from the Nixon Presidential Library and Museum. The Many Inspired Steps exhibit presents a chronological interpretation of the Apollo 11 mission from the launch, to the landing, to the safe return. 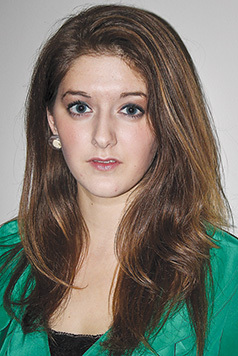 Besser Museum Education Coordinator Amanda Kucharek also developed a community engagement component for the exhibit. 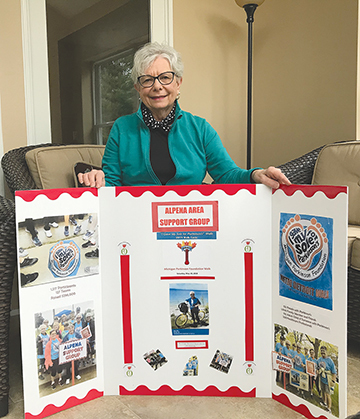 Kucharek is inviting community members to share their personal memories of where they were and how they felt as they witnessed the first man to walk on the moon. The stories will be included in the exhibition. The museum will also share these stories during a special Community Conversation at 7 p.m. on May 30 at the museum, free to the public. The conversation will be facilitated by Alpena Community College faculty member Tim Kuehnlein. Kucharek and Winckowski have also developed educational programming for school field trips, which include special planetarium presentations featuring the Apollo 11 mission. The Besser Museum hosts approximately 1,000 students visiting during April and May. The planetarium presentations and interactive educational components will also be available for the public to enjoy during the exhibition. “Part of the Besser Museum’s mission is to provide inspiring experiences through exhibitions and educational programming that will encourage our visitors to imagine the possibilities of their own potential and the contributions they can make to society,” Witulski stated. 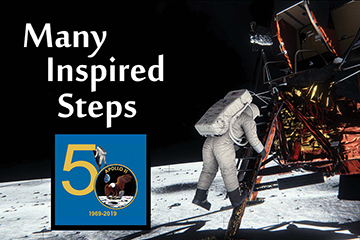 For more information about the Many Inspired Steps: The 50th Anniversary of the Apollo 11 exhibition and educational programs contact the Besser Museum at 989-356-2202 or www.bessermuseum.org. To share your story about where you were and how the moon landing impacted you, contact Besser Museum Education Coordinator Amanda Kucharek at education@bessermuseum.org. ¯ Opening reception, 3 to 5 p.m. April 27, Besser Museum. ¯ Community Conversations, 7 to 8:30 p.m. May 30, Besser Museum. ¯ Dark Sky: Moon Gazing, 8:30 p.m. July 13, Rockport State Recreation Area, cohosted by Besser Museum Planetarium, Friends of Rockport State Park, Alpena Visitor Bureau, George N. Fletcher Public Library NASA@MyLibrary, and the DNR. A Recreation Passport is required for all vehicles and is available in the Rockport Harbor boat launch area or at the gate. ¯ Free Family Fun Day, noon to 2 p.m. July 20, Besser Museum. Tina St. John, department head of public services and program manager of NASA@MyLibrary at Alpena County Library, will join museum education and planetarium coordinators to bring fun STEAM (science, technology, engineering, art, and math) activities to this free Saturday event.